The floor joist wood is beginning to show signs of severe damage due to failing crawl space supports. As these start to give way, the floors above can sag and interior walls may crack, resulting in expensive problems. At Ayers Basement Systems, we specialize in crawl space repairs of all types. If you're experiencing a structural problem with your crawl space, we have a solution for you. 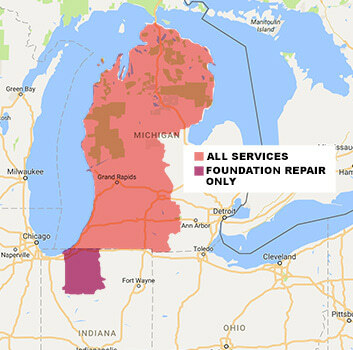 The SmartJack® is available for installation throughout Michigan & Indiana, including Kalamazoo, Lansing, Grand Rapids, Traverse City and nearby areas.